EmailGrades produces comparative benchmark reports for email service providers who are striving for excellence, and for institutional investors who want deeper insights about the email ecosystem. We measure and track ESP traffic health by observing what Gmail, Yahoo!, Outlook and AOL actually do with the messages sent by ESPs. Were they delivered to the inbox, or sent to the spam folder? We measure and track whether recipients read or ignore those messages. Our insights about inbox placement, recipient engagement and email volume provide business leaders with unique ESP-level insights to guide strategic decisions. Business leaders and investors value data-driven insights about ESP performance -- changes over time, as well as comparisons with a cohort of other ESPs. These insights become even more significant given the goal of growing revenues, profits, and market share amidst increasing opportunity and competitive pressures. While doing so, ESP customers, employees and influential members of the email ecosystem expect the company to maintain the quality of its service to ensure reliable email delivery. We measure so you can manage. Benchmark email traffic health versus similar ESPs to identify areas of potential improvement. Identify widespread delivery problems sooner. Observe the effect on traffic quality as an ESP makes changes to its team, processes, platform and policies. Are investments producing the intended results? Do Gmail, Yahoo!, Outlook and AOL trust the email you're sending? Initiate data-driven conversations with the right teams to correct delivery problems before they impact your business. Increase confidence that you are on the right track. Greater visibility and alignment improve the quality of your decisions and reduce anxiety about blind spots. Our custom email performance benchmark reports reveal how your overall deliverability and recipient engagement compare to other Email Service Providers like you. As industries mature, businesses need to know where they stand. Benchmarks. Guideposts. Clear landmarks that define excellence. Would your executives value independent 3rd party metrics that increase awareness of your email health? Do they wonder how your email performance compares to other ESPs? Do they want to set realistic deliverability goals and track progress toward them? Is our email health improving? Are we better than last month? 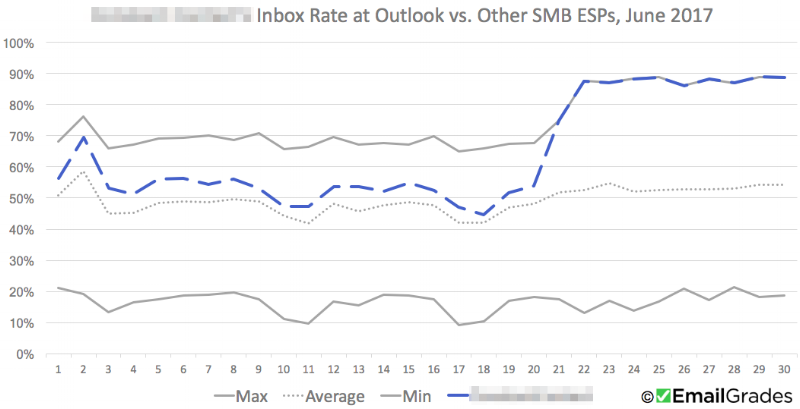 How does our inbox rate compare to other ESPs like us? What's realistically possible? How much can we improve? Did our investments in infrastructure, processes and people produce the results we expect? Did our inbox rate change significantly at Gmail, Yahoo!, Outlook or AOL? Are other ESPs affected too, or is this just us? Are recipients ignoring the email we send? Is our delivery operations team doing a good job? Measure, don't guess. Set appropriate goals. Track progress. Make adjustments. Improve. One probing question started us on our EmailGrades journey, "Have we over-invested or under-invested in our email delivery platform and team?" As former VP of Email Delivery at SendGrid, I had access to a wealth of internal metrics and insights, yet this one question was perplexing. To answer it truthfully and with confidence, we needed to understand how our email performance compared to a cohort of other ESPs like us. We had no convenient, accurate and fair way to benchmark the health of our email. With effort, we could use internal metrics to compare aspects of our current performance to our past performance, but we had no way to compare our inbox placement rates and recipient engagement rates to our competitors'. EmailGrades was born to help responsible ESPs answer those questions as they strive for excellence. We measure so you can manage.